Holi is a day away and it's time to play some energetic Bhojpuri Holi songs that are just tailor-made for this exciting Festival of Colours. We have the likes of Amrapali Dubey, Nirahua, Akshara Singh, Pawan Singh and others who released special Holi songs and music albums for the occasion. Holi also known as Phagwah, Rangwali Holi, Dhuleti, Dhulandi is a big festival in the state of Uttar Pradesh. While the entire country celebrates the spring festival with joy and fervour, the celebration in UP touches a new high every year. Uttar Pradesh boasts of significant Holi celebrations such as Barsana Holi, Lathmar Holi, Braj ki Holi, and more that are laden with colours, music, folklore, delicacies and cherished memories. Music is an integral part of this ‘Festival of Love’ and witnesses a string of Bhojpuri stars and singers croon on the special occasion. 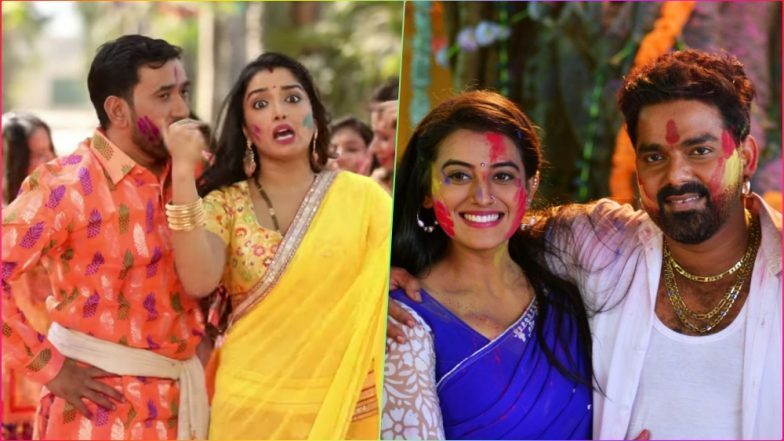 Happy Holi 2019 Songs Playlist: From Rang Barse to Balam Pichkari, Dance Away With These Old & New Bollywood Songs This Festival Of Colours (Watch Videos). Speaking of Bhojpuri songs and music videos, it does not need an introduction. However, for the uninitiated, the regional entertainment industry has caught the fancy of netizens never like in the past few months. Bhojpuri movies have beaten Bollywood in Google searches in 2018. Hard to believe, but that’s the reality. Bhojpuri actors, actresses and singers have all been in high demand, and it is not surprising to see them go all out on festivals and special occasions, which includes the big celebration of Holi. Holi Marathi Songs 2019: Ala Holicha San Lai Bhaari, Kheltana Rang Bai and Other Numbers That Will Make this Festival of Colours Musical! (Watch Videos). In 2019, several Bhojpuri Holi songs have been released and already garnered a million views on YouTube. “Rang Debo Choliya Tohar” featuring Anita Raj and Upender Lal Yadav, “Darad Hola Sejariya Par” sung by Akshara Singh, “Khelab Holi Me Rangwa” sung by Ranjita Sharma, “Fagunwe Me Gawna” sung by Dimpal Singh, “Jab Se Chadhal Ba Phagunwa” starring Monalisa and Pawan Singh, Amrapali Dubey and Dinesh Lal Yadav's hit Bhojpuri song "Rajneeti Mein Rangail" and more are promising to make your Holi parties a big hit. Here’s a look at the latest Holi 2019 Bhojpuri songs to shake a leg on. There is no denying that Bhojpuri songs are laden with vulgar lyrics and dance moves, but they have struck a chord with their audiences. Holi is that time of the year when people want to go all out with fun and celebrations. Colours, food, music and dance is all that people care for, and these super-energetic Bhojpuri songs are turning out to be just the perfect tracks to dance on for hours.